Heat a pan and add ghee. When ghee is hot add vermicelli and fry on medium heat stirring continuously. Fry the vermicelli till it starts to change color. Transfer the fried vermicelli into a bowl and keep it aside. Wash potato, carrot, green chilies & ginger. Peel potato and cut into small cubes. Cut carrot into small cubes. Peel onion and cut into small pieces. Finely chop the green chilies and grate ginger. If curry leaves are big chop them finely. Cut cashew nuts into medium sized pieces. Take a microwave safe bowl and add green peas, sweet corn, carrot pieces and potato pieces and add 10ml water. Place the vegetables bowl in microwave oven and cover partially. Cook the vegetables on high power for 5 minutes. Heat a pan and add oil. When oil is hot add cashew nut pieces and fry stirring till they change color to golden. Remove fried cashew pieces from oil and keep them in a plate. To the remaining oil add bengal gram and black gram and fry stirring till the seeds start to change color. Then add mustard seeds and cumin seeds and fry stirring till the seeds splutter. Then add chopped green chilies and grated ginger and fry stirring till chili pieces are crisply fried. Then add asafetida and curry leaves and mix. Now add chopped onion and fry stirring till they turn translucent. Then add cooked vegetables and mix. Add turmeric powder and salt and fry stirring for a minute. Now add the fried vermicelli and mix. Add water to the pan and mix well. Cook the upma on low flame for 2 minutes. 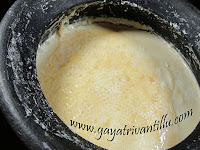 Remove lid and stir the upma and again cook covered on low flame for 2 more minutes. Remove lid and mix in fried cashew nut pieces. After a minute transfer the upma into a serving bowl and serve hot. If desired add lemon juice and mix before serving. Fry vermicelli on low to medium heat only or else it burns quickly. Also continuously stir the vermicelli while frying. 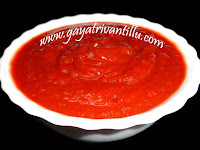 If desired grind green chilies and ginger to a coarse paste and use. Chopping the vegetables into small cubes would be helpful in getting cooked fast. Cooking the vegetables in microwave oven is an easy option which I always follow---as it saves us from keeping a watch while cooking and also vegetables get cooked evenly without becoming mushy with just little water in microwave oven. While cooking vegetables in microwave oven we have added 10ml water and the vegetables get JUST cooked with that amount of water. While making upma they get fully cooked. If more water is added to cook vegetables, drain the remaining water and use it and reduce that much amount of water. For every cup of vermicelli taken add 1 1/4cups of water to make upma ---this way the vermicelli absorbs less water and each strand looks dry. If required one can sprinkle some water at the end of cooking. Frying the vermicelli in ghee allows each strand from becoming sticky. If required add lemon juice to give the upma a tangy flavor. 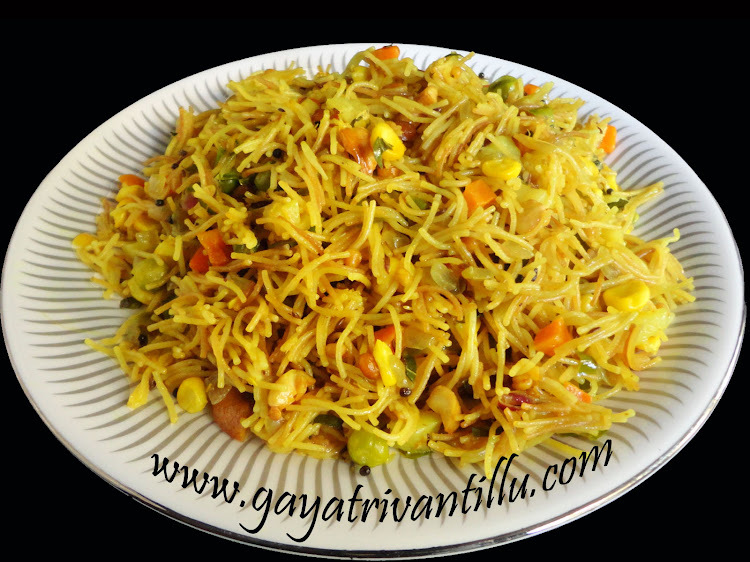 Serve the vegetable semiya upma with hot coffee.